Serves 2. Preparation time 2 minutes. Cooking time 5 minutes. Slice 50g chorizo sausage into strips and fry the strips in a hot pan until the oil leaks out. Whisk 4 eggs with a dash of cream in a cup a nd pour over the hot chorizo. When the eggs start to congeal at the bottom, flip the mixture with an egg lifter. Remove the pan from the heat when the other side starts to congeal. Use the egg lifter to break up the eggs and make sure all the raw egg lands on the bottom of the hot pan to cook. Sprinkle with chopped chives. Season to taste. Serves 2. Preparation time 5 minutes. Cooking time 20 minutes. Cut 250g boerewors into pieces and fry in a hot pan until brown. Remove the sausage from the pan, but leave the fat Slice 2 onions into rings a nd saute for 10 minutes over a low heat until the onions start to caramelise. Return the sausage to the pan, add Va cup beer and let the mixture simmer for 5 minutes. Season with black pepper and salt. 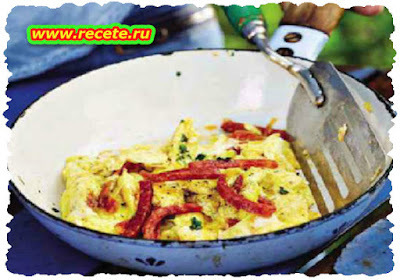 Fry 2 eggs in a separate pan. 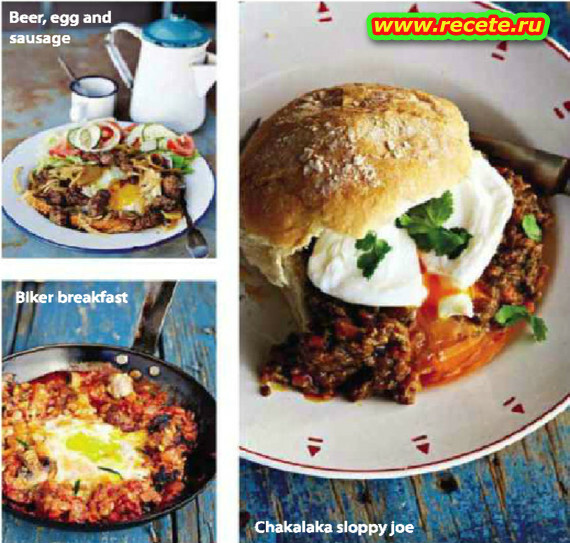 Serve the eggs on 2 thick slices of pot bread with the onion and sausage mixture. Slice 2 pork sausages and 4 strips of bacon into thirds. Fry the meat with a tablespoon of butter and add a handful of sliced mushrooms. Fry for 5 minutes before adding 1 tin of tomato and onion smoor, 1 tablespoon chopped rosemary and 1 tablespoon sweet chilli sauce. Simmer until the sausage is cooked and the sauce thickens. Make 2 pockets in the middle of the mixture and break an egg into each. Letthe mixture simmer until the egg is done to your taste. Serves 2. Preparation time 2 minutes. Cooking time 20 minutes. Fry 125 g mince and 1 teaspoon braai spices in a pan with a teaspoon of butter until brown. Add Vi tin chakalaka (remove the top layer of oil) and 2 tablespoons tomato sauce. Simmer for 10 minutes. Poach 2 eggs and butter 2 rolls. Fill the rolls with mince and put the eggs on top.